Located within the verdant vicinity of Viceroy Bali hotel, Apéritif is the brainchild of Belgian chef Nic Vanderbeeken, who used to helm the hotel’s award-winning dining haunt, CasCades. This new endeavour sees Vanderbeeken, who has 20 years of experience, taking on new challenges, this time, creating something from scratch and carving out his own creative carte du jour. The name Apéritif suggests the long-standing European tradition of enjoying a pre-dinner drink. So our first stop for the evening is — you’ve guessed it — the bar. Beautifully appointed, with perfectly framed views of terraced rice paddies on one end and jungly gorge galore on the other, the drinking den arouses an opulent Roaring Twenties-type interior. And one of our favourite drinks here is the Tamarillo Negroni. The tangy sweetness from the tomato-looking fruit — common in Indonesia — adds a refreshing dimension to the iconic bitters cocktail. Another must-try tipple is the Margaretha, which utilises Patron tequila for the citrusy mix. The name Margaretha also plays homage to Viceroy Bali’s family matriarch, Margaret Bainbridge, who likewise helped with designing most of the new colonial-informed space, including a selfie-inducing lavatory. Canapes are also served, perched on a tree-like tray as you nurse your drinks at the bar. This statement serving-stand sure makes a standout piece — in more ways than one. The tree represents sustainability and the crusade against waste, boosted too via how the canapes are made: Out of scraps from prepping the restaurant’s main degustation menu. For example, the fish crudo with yogurt and dill sits on a fish skin cracker made from the surpluses of Apéritif’s ceviche, one of the winning entrees. 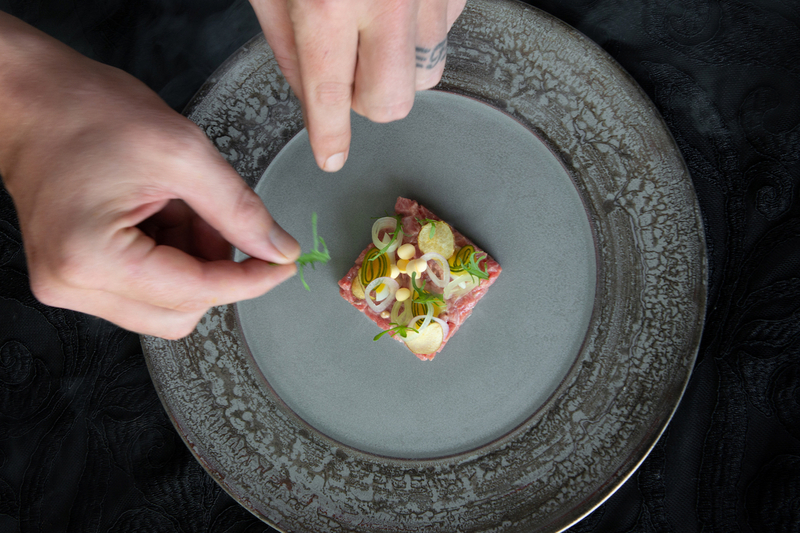 Your eight-course repast starts at the spacious dining area with a clear view of the open kitchen, where chef Vanderbeeken and his team are in full view, commanding their post amid ultramodern equipment — most are custom-built for the restaurant. Another appetiser that teases the palate is a modern, almost glamourised version of the Karedok, a raw vegetable salad doused in peanut sauce with origins from West Java. This one comes beautifully plated, where perfect slices of pickled cabbage, cucumber, lettuce and other greens are carefully wrapped to look like a colourful bud. The dish is a clear homage to the restaurant’s homeland and its peanut sauce is supposedly from chef Vanderbeeken’s Indonesian wife’s own recipe. For a truly whirlwind, full-bodied experience, indulge in the wine pairing option, which sees the karedok washed down smoothly with a glass of Chilean Chardonnay. Mains include choices between Iberico Pork or Duck Magret; Papua Crab or Canadian Lobster. What we tasted were the pork, served with piccalilli, pumpkin and chicharron, as well as the lobster, immersed in an earthy emulsion of salsify sourced from Bedugul, a town in the north of Bali. Everyone gets a moreish slab of Venison Wellington that features a foie gras heart, cut tableside by chef Vanderbeeken, which pairs heavenly with a sip of South Africa’s The Boekenhoutskloof The Chocolate Block 2016. Of sourcing for ingredients, chef Vanderbeeken makes sure he gets only the best — blue crab from Papua New Guinea, acorn-fed Iberico pork from Spain. But when he finds local ingredients that he believes are of high-enough quality, he’s more than happy to work with them. The main ingredients on the menu are mostly imported but the chef recently managed to find good pork farmed in the northern highlands of Bali that’s now sitting in the kitchen, as it cures and is preserved with an outer layer of some Bali beeswax. Bali is also known for its fresh fish so that’s locally sourced too. And of course, most of the vegetables come straight from Viceroy Bali’s own greenhouse. This “glocal” appeal is no more apparent than when McKinstry pulls out a silver salver of petits fours at the end of dinner service at Apéritif. Arranged neatly, they look like a colourful flag as a whole, which is apt as these morsels are flavourful representations of the kitchen team’s nationalities. To name a few, there’s renditions of the Indonesian kueh lapis, American Snickers, Mexican tres leches, and Belgian chocolate truffle — though this one’s given a green sheen and has a palm sugar filling, almost passing off as an ondeh-ondeh, further implying a cross-cultural, mixed baby of a treat. The mix of provisions makes dining at Apéritif not merely farm-to-table but also a world-to-Bali, maybe even Bali-to-world culinary experience.